THE POWER PLANT ... at the Garstadverken in Linkoping, waste is turned into energy. SWEDES recycle nearly 100% of their household waste. They even have to import waste to have something to burn, to turn waste into energy. A true recycling revolution. Wouldn't it be great if no household waste was wasted? If each and every item of refuse was turned into something else – new products, raw materials, gas or at least heat? Sweden is almost there. More than 99% of all household waste is recycled in one way or another. This means the country has gone through something of a recycling revolution in the last decades, considering that only 38% of household waste was recycled in 1975. Namibia has also taken its first steps towards having zero waste. Rent-A-Drum, a Namibian waste management company, erected its newest plant after striking an agreement in 2016 with Ohorongo Cement, for the supply and delivery of non-recyclable material to use during the cement manufacturing process. About 12 000 tonnes of non-recyclable material collected by Rent-A-Drum annually, will be used at Ohorongo Cement's plant, along with other alternative fuels to fire the kiln, which is one of the key processes during cement manufacturing. The use of alternative fuels is a common practice in cement factories, although only in Europe. The increasing energy prices, global climate change and multiple other environmental benefits have been motivated the cement industry to invest in alternative fuels since the 1970s. Since its commissioning in 2011 through consumption of wood chips, charcoal fines, and now refuse-derived fuel, Ohorongo Cement has taken the lead in Africa in this department. Weine Wiqvist, CEO of the Swedish Waste Management and Recycling Association (Avfall Sverige) still thinks Swedes can do more, considering that about half of all household waste is burnt, that is, turned into energy. He explains that reusing materials or products means using less energy to create a product, than burning one and making another from scratch. “We are trying to 'move up the refuse ladder', as we say, from burning to material recycling, by promoting recycling and working with authorities,” he says. Meanwhile, Swedish households keep separating their newspapers, plastic, metal, glass, electric appliances, light bulbs and batteries. Many municipalities also encourage consumers to separate food waste. And all of this is reused, recycled or composted. Newspapers are turned into paper mass, bottles are reused or melted into new items, plastic containers become plastic raw material; food is composted and becomes soil or biogas through a complex chemical process. Rubbish trucks are often run on recycled electricity or biogas. Wasted water is purified to the extent of being potable. Special rubbish trucks go around cities and pick up electronics and hazardous waste such as chemicals. Pharmacists accept leftover medicine. Swedes take their larger waste, such as a used TV or broken furniture, to recycling centres on the outskirts of cities. A closer look at the 50% of the household waste that is burnt to produce energy at incineration plants. 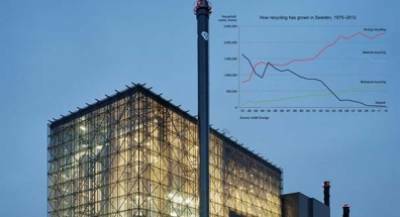 Waste is a relatively cheap fuel and Sweden has, over time, developed a large capacity and skill in efficient and profitable waste treatment. In 2014, Sweden even imported 2,7 million tonnes of waste from other countries. The remaining ashes constitute 15% of the weight before burning. From the ashes, metals are separated and recycled, and the rest, such as porcelain and tile, which do not burn, is sifted to extract gravel that is used in road construction. About 1% still remains and is deposited in rubbish dumps. The smoke from incineration plants consists of 99,9% non-toxic carbon dioxide and water, but is still filtered through dry filters and water. The dry filters are deposited. The sludge from the dirty filter water is used to refill abandoned mines. 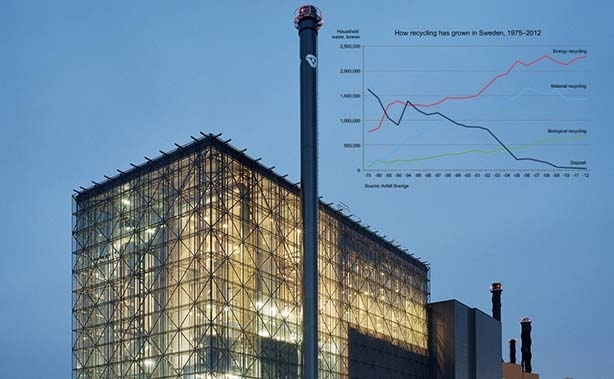 In Sweden, burning waste to produce energy is uncontroversial, but in other countries – like the US – it is a much debated topic. Hans Wrådhe at the Swedish Environmental Protection Agency (Naturvårdsverket) considers proposing a higher levy on waste collection. “That would increase everybody's awareness of the problem,” he says. Together with government agencies and corporations, Wrådhe has developed an action plan for waste prevention, including how to encourage producers to make products that last longer. The agency also considers proposing a tax deduction for some repairs.